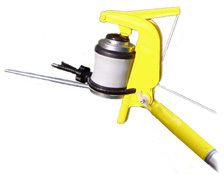 The Gotcha SpayerTM is an adaptor that enables you to attach and trigger virtually any type of aerosol can from the end of an extension pole. 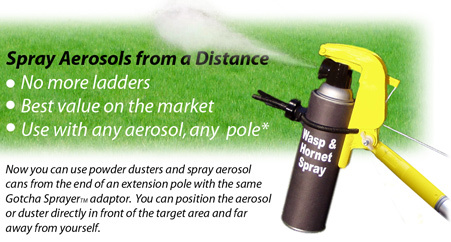 Now the Gotcha SprayerTM Pro adaptor will work with aerosol cans and our Powder Duster... Dust or Spray for one low price. Copyright © 2006 4Most Innovations, L.L.C. This page contains useful links and is a great resource for people with allergies. Specialist support groups and media articles. The best article I have read yet about my particular problem - well written too for the non-technical! Journal of Allergy and Clinical Immunology Probably the top Journal on our subject with useful summaries on latest research that even the laymen might understand. Harvard's Virtual Library Yet another amazing repository of allergy info! Defeating Death's Sting Article about Claude Frazier MD who fought in the US for improved awareness of insect sting allergies and their life threatening effects. Still lots to do though! Bee Stings and Bites Full article about the issues and the problems from the Intellihealth website. Healing Well Well designed resource general resource with some helpful articles on immunotherapy and allergies generally. Excellent site dedicated to food allergy and prevention of death through anaphylaxis - the founders of the campaign tragically lost their child through anaphylactic shock. The Anapen EpiPen's competitor the Ana-pen gets a good rating from this article from Canada - less brutal than the EpiPen since it just has a button to push to make it work - no thigh stabbing needed! ALK-Abello One of the companies that manufactures the serum used in insect sting immunotherapy - interesting site. The Epipen® Information on Epipen® - the other sort of automatic injector and the most commonly employed around the world. Hollowtop Outdoor Living and Leisure with information on how you can enjoy eating insects - if they don't sting you first! Bees and other Stinging Insects Cute and parent friendly book on insect stings and lots of other information about stinging bugs, treatment etc.